AA is changing; with more acquisitions the aggregate size of RTI and Rixson (for a 50/50 mixture stock/cash) the share of downstream revenues could reach 40% and result in a decline of 30-40% in earnings volatility. Normal earnings could reach $1.75-2.00 per share if the suggested synergies can be achieved and repeated. At an historic average relative multiple for AA, this would generate a value well above $30 per share. Improvements in returns on capital will depend on prices of acquisitions and the success in achieving/beating synergy goals. The recent underperformance related to the AA and RTI deal thus creates an opportunity to buy a compelling story at a bargain price. 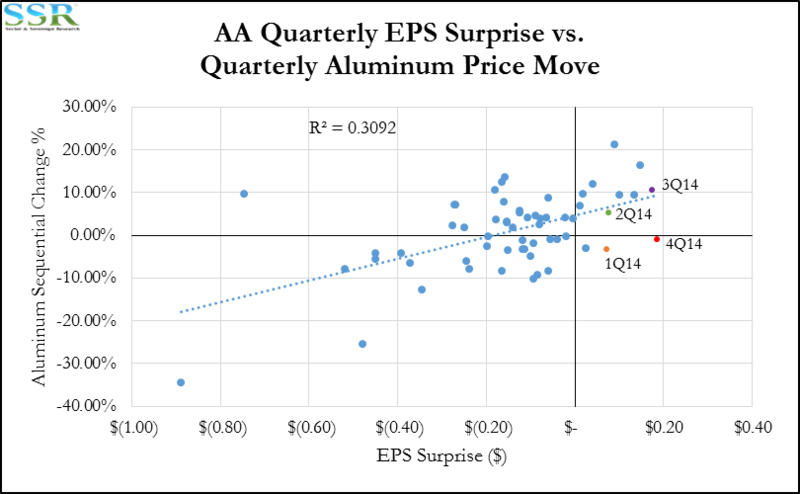 AA has managed to beat rising earnings expectations in each of the last four quarters, in periods of both rising and falling aluminum prices – the story is changing and changing for the better. 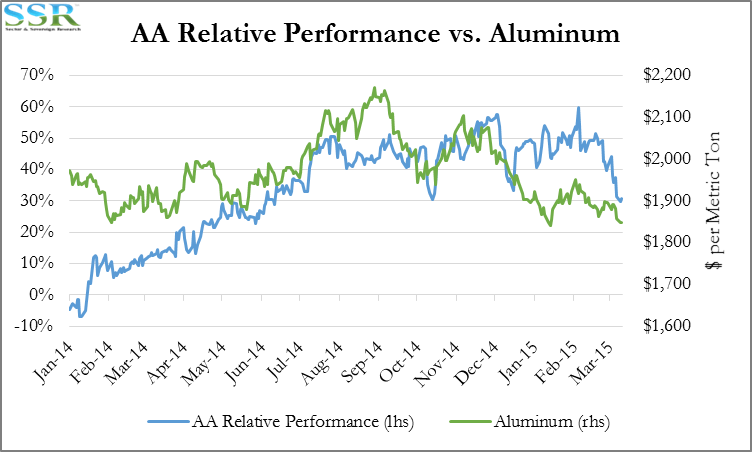 Demand drivers remain solid for aluminum. Global consumption of aluminum continues to rise more quickly than for any other base metal, despite slower global commercial construction growth. Aluminum prices have softened only modestly in recent months with oversupply being largely restricted to China and the pull on China products rising as global demand grows and incremental capacity outside China closes. AA’s acquisitions appear both logical and part of a very clear diversification as well as integration strategy. Our earnings and price target assume no real improvement in the base metal business as a contributor to AA’s earnings and given the growth rate in demand, a metal pricing upcycle looks likely within the next couple of years. AA’s strategy clearly does not relay on this. To those of you simply watching the aluminum price: you are missing the bigger picture. This is a company transforming its portfolio and at the same time working to improve its competitive position in the commodity. AA has beaten consensus for the last 4 quarters and has done so in both rising and falling aluminum price environments – Exhibit 2. The company clearly has enough offsets in the portfolio in the form of new businesses, either won or acquired, and lower costs. Earnings momentum and revisions remain positive despite a weaker commodity in dollar terms – less weak in non-dollar terms. But it is unlikely to be smooth sailing all the way from here. Like everyone else with international exposure, AA is at risk from the value of the dollar. Half of the business is in the US with roughly 22% in Euro denominated Europe. This will be drag on earnings, and the near term trends in Aluminum itself will not help – Exhibit 3. Aluminum pricing is falling for two reasons: the rising dollar and increased exports from China in recent months, though we believe that the dollar is dominant and that increased China exports are a reflection of stronger international demand as much as they are a reflection of China surpluses. 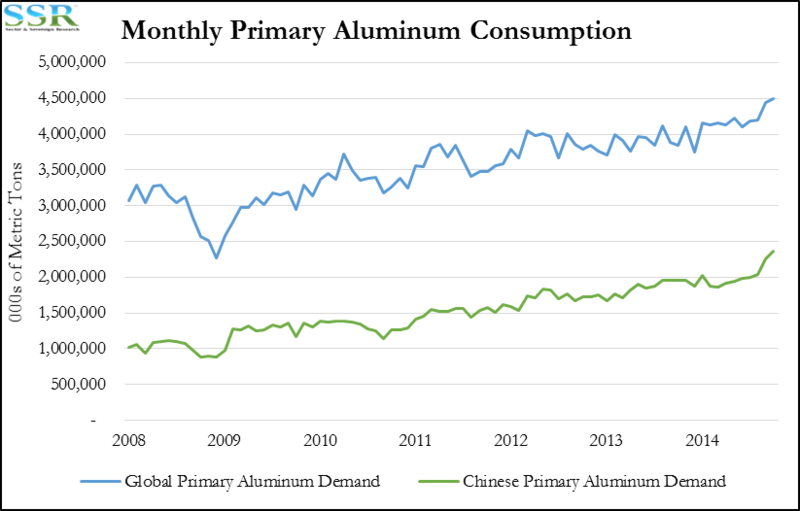 Aluminum demand continues to grow rapidly, pulled by autos and aerospace with more and more auto producers around the world sourcing parts from China. We estimate that Alcoa can continue its downstream acquisition strategy and add as much again as it has done with RTI and Rixson without diluting shareholders meaningfully – 10-11% – but at the same time drive down earnings volatility and drive up normal earnings, mostly driven by the synergies of the combinations, but also by the expected stronger growth of the acquired businesses through the current strong aerospace cycle. The obvious risk is that the aircraft replacement cycle rolls over in 4-5 years, but fuel efficiency innovation in the aircraft sector should keep demand strong for some time. It would probably help the diversification strategy at AA if the next couple of deals focused downstream ex-aerospace rather than more aerospace. Simply applying AA’s trend return on capital to the increased capital base implied by the acquisition strategy we raise normal earnings by around 30% and if we apply current return on capital we get the low end of our $1.75-2.00 per share view. 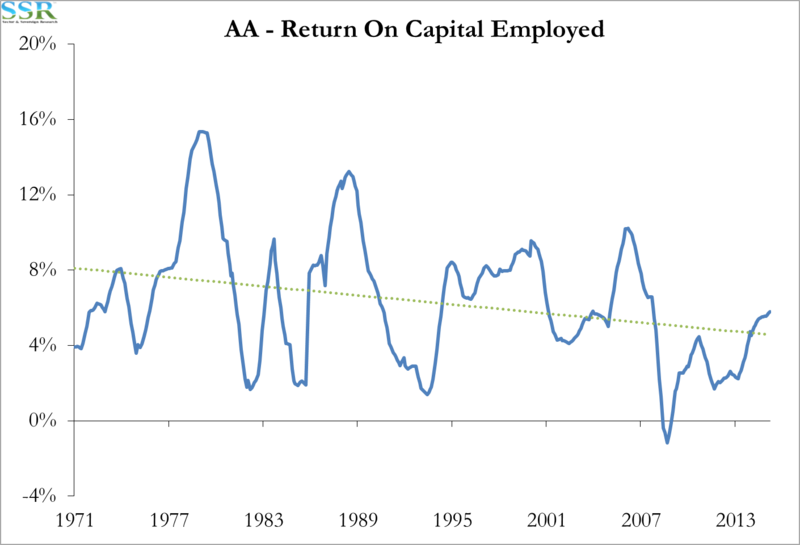 This is without any recovery in the Aluminum cycle. With all these you get the $1.75-2.00 normal earnings and a $30 stock based on conservative multiples – if you just believe 1-3 you get a $20+ stock which is still significant upside from here. End Markets Intact but Underappreciated! In the meantime, as we have written in recent research, it is clear that the sell side is not modeling the company properly as we are only seeing estimates increase in reaction to earnings surprises. No one is getting there first! 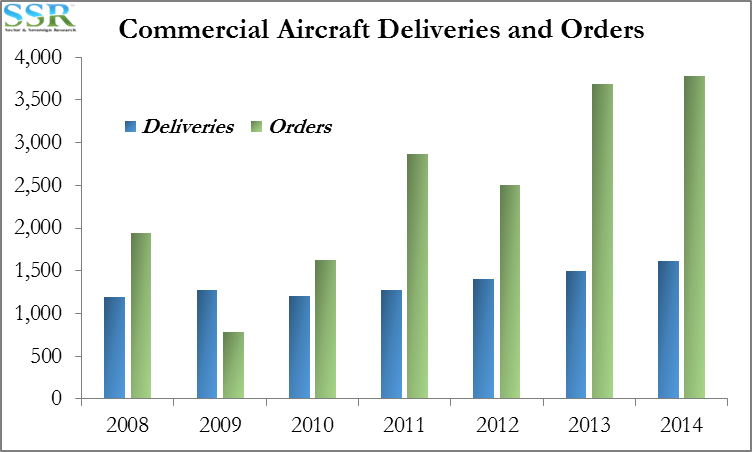 The aerospace related businesses, the integration and cost cutting opportunities provided by the acquisitions, as well as asset rationalization in aluminum and cost controls are driving the stronger earnings and RTI now provides another set of levers to pull. The momentum is impressive in the face of a volatile base metals market and should cause people to have another look at the way they model the company – Exhibit 4. We believe that the most recent slight negative revision is currency driven and is probably appropriate. The company’s businesses themselves are still operating in relatively favorable environments, despite the recent more negative global economic growth revisions and the slower expectations from China. 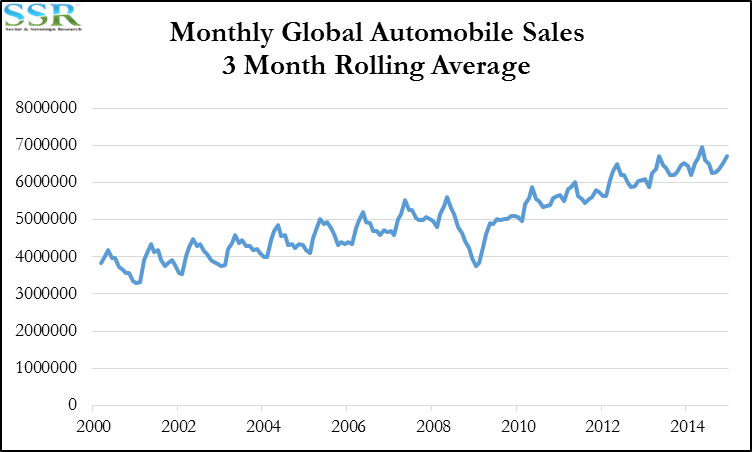 In the transportation space, we see this continued demand growth for commercial aircraft and automobiles – Exhibits 5 and 6. While these are only two end uses, they are both sensitive to falling oil and price conscious buyers. For a broader gauge of aluminum demand, we look to Exhibit 7 where we illustrate aluminum consumption for the world and for China, the most consumptive nation. 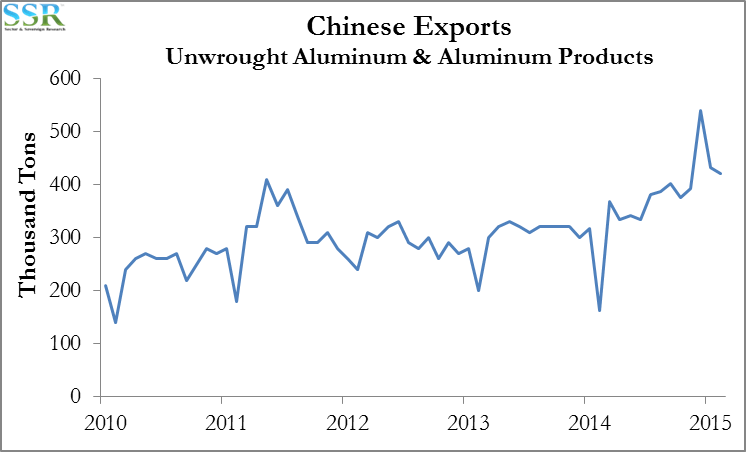 After a spike in exports from China in December – Exhibit 8 – we had fleeting concerns about the country’s demand for the metal but it seems that those concerns were not entirely justified, though a significant portion of the base aluminum consumption in China is to make parts that are subsequently exported. Note that China, for the most part, is not dumping this material into the international market. These exports are products, such as auto parts that have been ordered by consumers outside of China, and reflect China’s growing role as a producer of aluminum parts for a number of industries as well as consumer goods and other finished aluminum products. Perhaps more compelling is a look at return on capital for AA – Exhibit 9. The company has a return on capital above its long-term trend while metal prices remain depressed, especially relative to energy. Our normalized model, which is driven off the return on capital trend suggests a $19 per share price today, but if the business is as different as we think, normal earnings could be as high as $2.00 per share, driving a price well above $30. (We still believe that AA is the most likely double in our broad universe). Over the last four quarters in particular, we have seen the payoff from management’s moves towards value added products and a more manageable cost base. 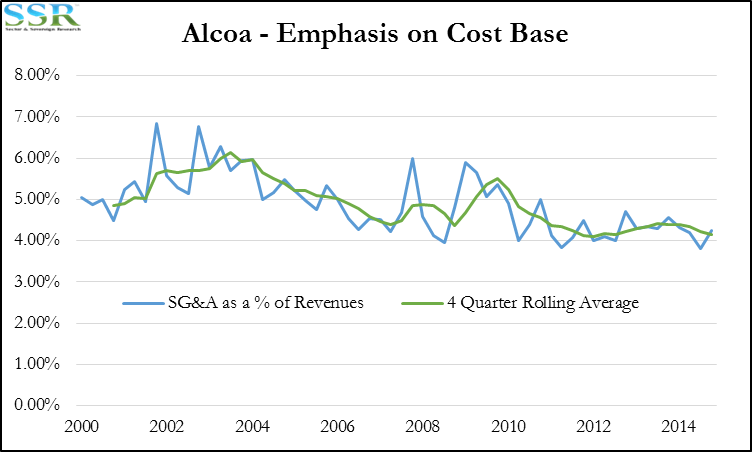 While the installation of Klaus Kleinfeld at the helm of Alcoa is old news, the company’s focus on costs under his stewardship appears to be lost on the market. 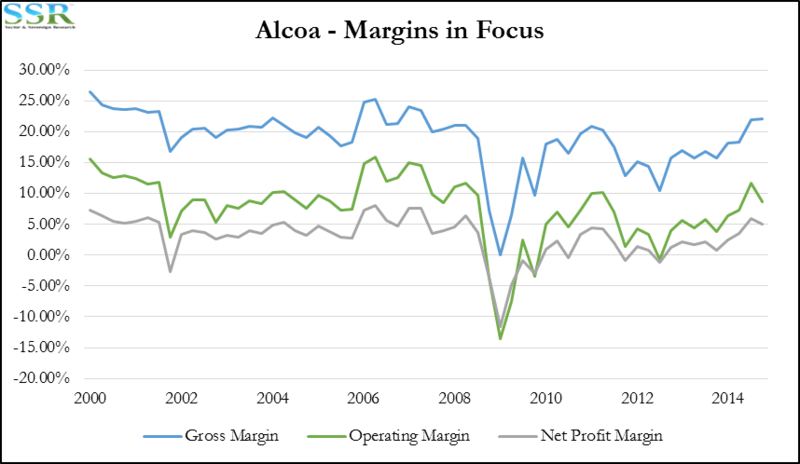 We highlight Alcoa’s margins and SG&A expenses in Exhibits 10 and 11, respectively. Note that they too have mostly decoupled from aluminum which has fallen 32% from its April 2011 peak. 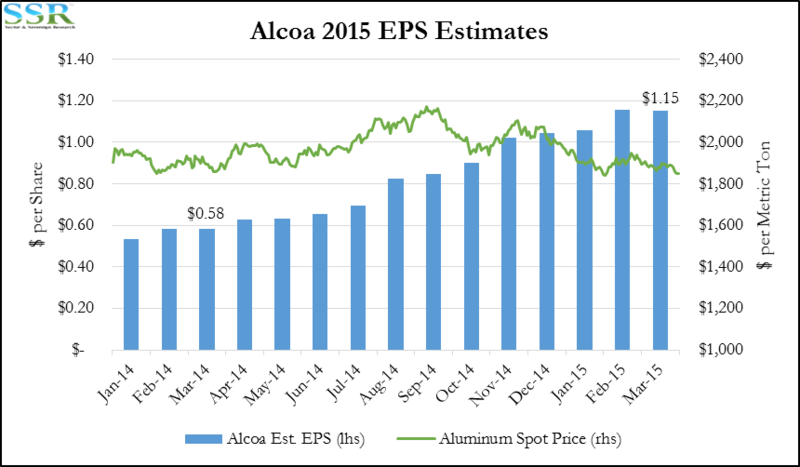 While costs are only one part of the narrative, they helped Alcoa reach its positive earnings surprises in 2014. AA is diversifying and, to a degree, integrating with first its Rixson acquisition and now RTI. While revenues are small relative to Alcoa’s total, the more interesting story is the integration and the cost opportunity, greater on the Rixson business now than before AA has purchased RTI. 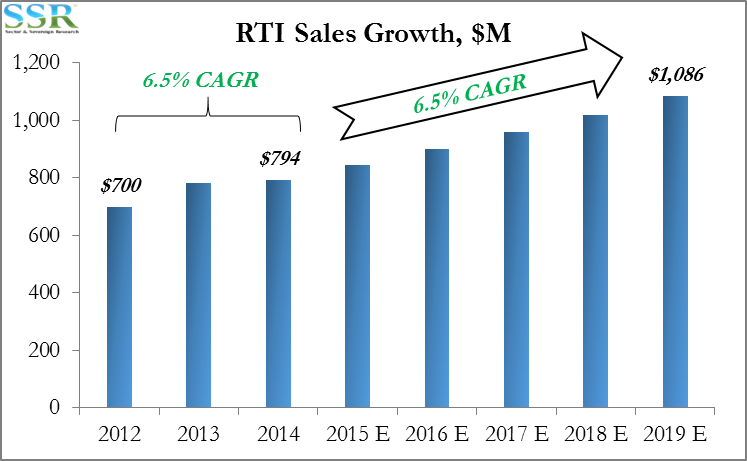 Adding less than 5% to sales, RTI may give the company an opportunity to significantly cut overhead and SG&A costs across the new combined platform and it is worth noting that the earnings benefit could be a multiple of the revenue benefit. AA’s targets for sales for RTI are shown in Exhibit 12. The growth targets mimic recent history and, given the backdrop of strong aerospace forecasts, do not seem unreasonable. Finding a couple of hundred million in cost synergies across the entire AA/Rixson/RTI platform also does not seem unreasonable to us. But what if AA continues down this path? AA has paid roughly $4.2bn for the two big acquisitions to date, adding around $2.0 bn of current revenue, with an expected addition of $2.6-2.8bn by 2019 from these two platforms – the company also expects to drive EBITDA to as much as $750 million based on the specific RTI claims and the commentary around Rixson earnings and expected synergies. We believe that the individual synergy targets become easier because of the second deal. Take the downstream portion of the business to more than 40% of the total – greater if there is more rationalization of the older base metal assets. This results in faster growth, which is good, and likely much less volatility, certainly in the near term, which would be good for the company’s multiple. 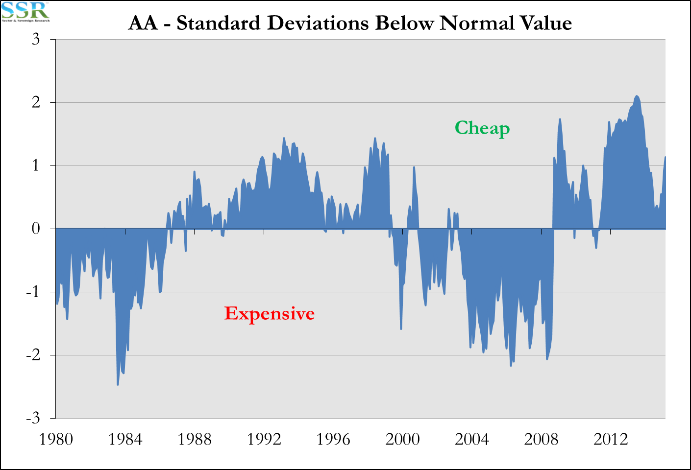 A one standard deviation swing in AA’s return on capital has been 48% around the trend line for the last 30 years. If we assume a 12% swing for the recently acquired businesses and assume that the company doubles the acquisitions, we get the volatility down to 33%. This change would move AA from an outlier in the Industrials and Materials space to something much more normal. Separately, driving costs out of the acquisitions, through synergies, should increase normal earnings for AA, from a current level of around $1.00 per share to at least $1.75 per share and higher if the synergy numbers can be surpassed.